And after the heavy recipe I posted yesterday, I felt like things around here needed to be lightened up a little. That’s where this baked oatmeal comes in. I’ve been dying to make a baked or an overnight oatmeal recipe for years but for whatever reason, I never pulled the trigger and sought out a recipe. So it was pretty handy when this recipe stumbled upon my doorstep over the summer for the first time. 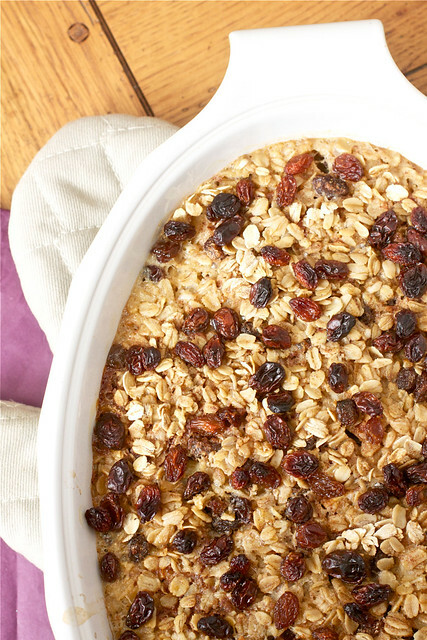 I immediately fell in love with the components of this baked oatmeal and how the fruit could be so easily changed for preferences or seasons. The original recipe calls for bananas and blueberries but I made mine with apples, raisins, and I added a bit more cinnamon. And while this combination reminded me of the oatmeal packets I grew up on, this version was no comparison with its freshly baked apples, plump raisins, and lots of cinnamon swirling around the oatmeal. This was my kind of breakfast! The difficulty level of this recipe? Nil. You’ll put a layer of some of the fruit on the bottom of the dish followed by all of the dry oatmeal mixture, then pour over a mixture of milk, eggs, maple syrup, and vanilla, top with some more fruit and bake. So easy! I whipped up my first batch one Sunday morning a couple weeks ago while Kyle slept in (never happens) and I actually wrote and scheduled an entire blog post before it finished baking – talk about time efficiency! I think what I love most about this baked apple cinnamon raisin oatmeal is that a full batch yields leftovers for Kyle for 3 mornings and since in the winter months he takes a packet of apple cinnamon oatmeal with him to work for breakfast nearly everyday, we now not only have a cheaper alternative to those packets, but also oatmeal fresh fruit and without any preservatives. It’s a win-win all around! Preheat oven to 375 degrees. Grease or spray a 2-quart casserole dish with either butter or cooking spray. In a medium bowl, toss together the oats, baking powder, cinnamon, and salt. In a separate small bowl, whisk together the maple syrup, milk, egg, the melted butter, and the vanilla. Place the diced apples in a single layer in the bottom of the prepared casserole dish. Sprinkle about two-thirds of the raisins over the top of the apples, then cover the fruit with the oat mixture. Drizzle the milk mixture over the oats, making sure to distribute the milk as evenly as possible. Sprinkle the remaining raisins over the top of the oats. Bake the oatmeal for 35-45 minutes, until the top is golden brown and the oats have set. Remove the oatmeal from the oven and serve hot with more maple syrup. Wow this sounds perfect for this chilly morning in Kentucky! I really enjoy baked oatmeal. I’ll have to try this one. I love this recipe, too. Your adaptation looks wonderful. I was thinking of something along these lines. Thank you for making it an already easy recipe even easier for me! Awesome recipe. It’s warming my bones right now as the rain pours down outside and the temps. are dropping to the 50’s. Love it! Just the right amount of fiber you need in 1 dish…Love this! I have never had baked oatmeal before. But, being a big fan of oatmeal I am intrigued. I will for sure have to try this. Wow, this looks good! I am so going to try this recipe this week!! In step 2 you mention adding “half of the walnuts” but walnuts aren’t listed in the ingredients list, nor is the addition of the remaining half mentioned in any subsequent steps. How much of the walnuts did you use and when did you add the second half? Breakfast today? I think so! Yum. This looks like the perfect fall morning dish. 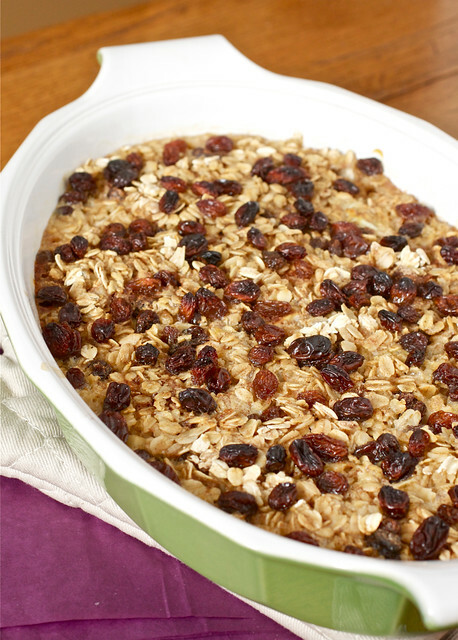 I love the idea of using raisins in this…or maybe dried cranberries too. Yum. I have to stop and thank you. Since giving up bread, which meant giving up bread pudding, I haven’t found anything that tastes even REMOTELY like my favorite dessert…..UNTIL NOW!!! Thank you, thank you, thank you!!! I stuck our leftovers (not much!) in the frig overnight and discovered pure heaven the next morning! I couldn’t believe how similar the taste was to my sorely missed bread pudding! And the texture became closer, too! I traced the recipe back through the other food sites…..and will probably try other variations…..but will stick to this one on a regular basis FOR SURE! I can’t thank you enough for taking this in a slightly different direction and adding the extra cinnamon! The custard-like bottom with the apples is simply dreamy! I’m afraid I might actually dream about this stuff!